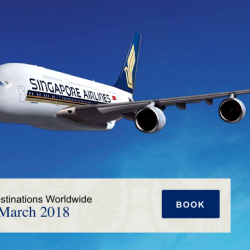 Book by 12 Mar 2019 Singapore Airlines: Fly to Over 50 Destinations Worldwide with Special Mastercard Fares from SGD128! Travel in comfort and enjoy Singapore Airlines' award‑winning service. With great fares to over 50 destinations, you can experience the culture of Penang from SGD128, the vibrancy of Bangkok from SGD228, and many other exciting destinations worldwide. Enjoy 2-to-go special fares with Mastercard when you book a getaway with your loved ones from now till 12 Mar 2019! 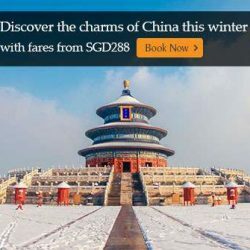 Book by 29 Dec 2018 Singapore Airlines: Two-to-Go Fares to Over 70 Destinations from SGD148 for Travel Dates in 2019! 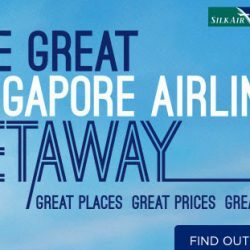 Enjoy great fares to over 70 destinations with Singapore Airlines and SilkAir from SGD148! Travel from 1 January to 31 May 2019. Book your holiday by 29 December 2018! 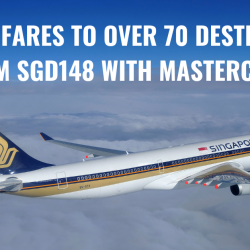 Explore these exciting destinations with Singapore Airlines' attractive all-in fares for Mastercard from SGD148! Minimum two to travel. Book by 16 Dec 2018. 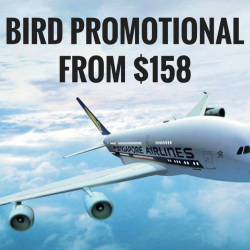 Book by 31 Mar 2019 Singapore Airlines: Special Fares to Over 100 Destinations from SGD168! Experience a new culture. Enjoy a romantic getaway. Entertain the whole family. 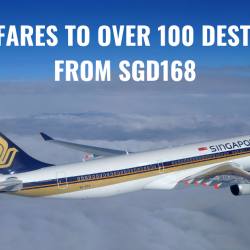 Whatever your reason for travel, wherever you wish to go, take advantage of these special fares from Singapore Airlines to more than 100 destinations around the world! You can travel alone this time as there is no minimum 2 to go! Book by 31 March 2019. 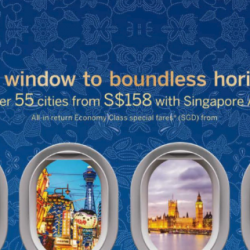 Book by 31 Oct 2018 Singapore Airlines: NEW 2-to-Go Sale Fares to over 80 Destinations from SGD158! Experience a new culture. Enjoy a romantic getaway. Entertain the whole family. 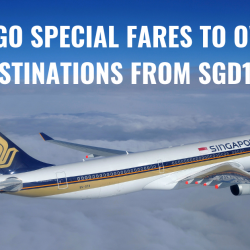 Whatever your reason for travel, wherever you wish to go, take advantage of these special 2-to-go fares from Singapore Airlines to a host of destinations around the world! Book by 31 October 2018. Book by 27 Sep 2018 Singapore Airlines: The Great Singapore Airlines Getaway with Sale Fares from SGD148! There's no better time to experience more of the world with Singapore Airlines and SilkAir. Enjoy great fares to the world's top destinations, along with a variety of perks to make travelling more rewarding. KrisFlyer members will also be eligible to participate in a lucky draw to earn one million KrisFlyer miles! Book by 27 September 2018. 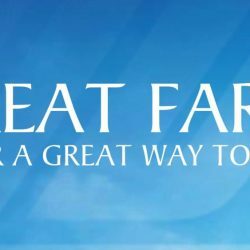 Book by 23 Aug 2018 Singapore Airlines: Travel Fair Special Fares from S$148 Plus Exclusive Perks from American Express, DBS/POSB, HSBC, UOB & Mastercard! Take advantage of these special fares to exciting destinations worldwide with Singapore Airlines and SilkAir. 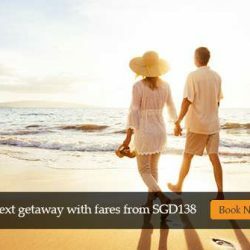 Book before 23 August 2018 at singapore.com/travelfair or SingaporeAir Mobile app to enjoy exclusive perks from participating partners. Visit the Singapore Airlines booth at the Travel Revolution 2018 (3 - 5 August) and NATAS Holidays 2018 (17 - 19 August) with exclusive giveaways and activities. Book by 31 Jul 2018 KrisFlyer: Spontaneous Escapes with 40% OFF Miles Required to Bangkok, Bangkok, Yangon & Phnom Penh in August! 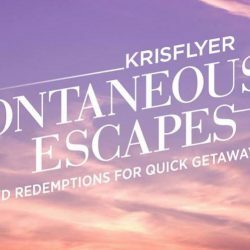 KrisFlyer Spontaneous Escapes is one year old! To celebrate, they are offering 40% off the miles required for redemption to selected destinations. Book by 31 July for travel from 1 to 31 August. 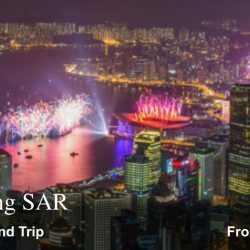 Book by 20 Jul 2018 Singapore Airlines: Special Fares to Hong Kong from S$238 All-In! Fly SQ and discover the vibrant city of Hong Kong with exclusive all-in fares from SGD238! 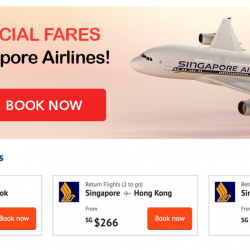 Depending on the travel period, there's 3 different promo fares starting from S$238. Book by 20 July 2018 for the best offer! Limited time only! ZUJI: Singapore Airlines Special Fares to Bangkok, Hong Kong, Tokyo, Seoul & More from only $199! Grab these Singapore Airlines special fares at ZUJI before they are gone! Fly to Bangkok, Hong Kong, Tokyo, Seoul and more from just S$199 from now till end of year! Limited time only. In need of a holiday this June? Fulfil that wanderlust when you fly SQ with irresistible all-in fares, minimum two to travel. 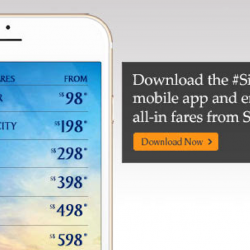 Book by 30 Jun 2018 Singapore Airlines: Enjoy Exclusive Singapore Air Mobile App Fares from SGD98! 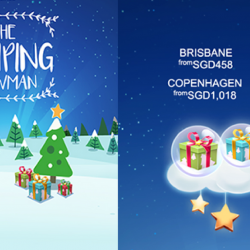 Book your next getaway on the Singapore Air mobile app and enjoy exclusive all-in fares from SGD98! Book by 30 June 2018. Don't miss special all-in return Economy Class fares to over 55 exciting destinations on Singapore Airlines! Book with your American Express card and redeem S$30 CapitaVouchers. T&Cs apply. Enjoy special fares to Perth, Melbourne or London with Mastercard for travel from May to June 2018. 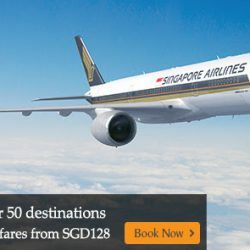 Apply the exclusive promo code on singaporeair.com or SingaporeAir mobile app! Book before 30 April 2018. Book early to enjoy great fares to over 55 beautiful and exotic destinations for your gateway! Sale period starts from now till 30 April 2018. Enjoy minimum 2 to travel special fares to over 90 destinations worldwide on Singapore Airlines and SilkAir for your next getaway. 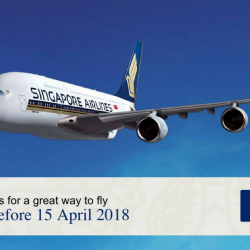 Get more out of your ticket when you book any Singapore Airlines or SilkAir ticket purchased on singaporeair.com or SingaporeAir mobile app from 21 March till 15 April 2018. From free luggages to cashback and travel WiFi offers, your Singapore Airlines or SilkAir ticket comes with exciting perks to make every journey more rewarding. Terms and conditions apply. Find out more here. Experience a new culture. Enjoy a romantic getaway. Entertain the whole family. 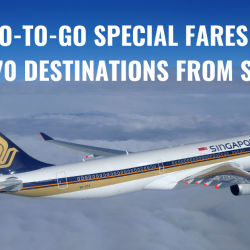 Whatever your reason for travel, wherever you wish to go, take advantage of these special 2-to-go fares from Singapore Airlines to a host of destinations around the world! Book by 22 February 2018. Book early to enjoy great fares to over 55 beautiful and exotic destinations for your getaway! Offer ends 31 March 2018. 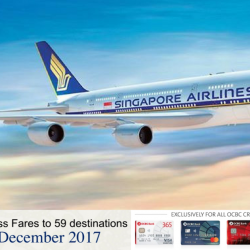 Book by 31 Dec 2017 Singapore Airlines: Coupon Codes Unlocked for Special Fares from $178! Get Frosty the Snowman jumping this Christmas and stand to win KrisShop vouchers, Adventure Cove Waterpark annual passes and promo codes! Be the all-time top scorer to win an exclusive Tumi carry-on luggage with Singapore Airlines' batik print lining worth SGD1,020. Play at singaporeairgames.com from now till 31 December 2017. 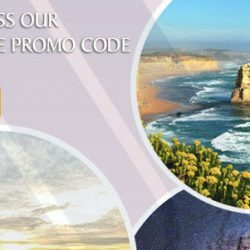 Enjoy special fares to Dubai, Beijing, Melbourne, Seoul, London and more with these coupon codes! Experience a new culture. Enjoy a romantic getaway. Entertain the whole family. 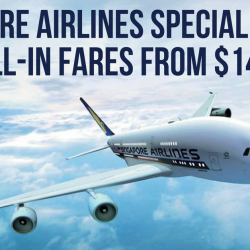 Whatever your reason for travel, wherever you wish to go, take advantage of these special fares from Singapore Airlines to a host of destinations around the world! Book by 31 December 2017. 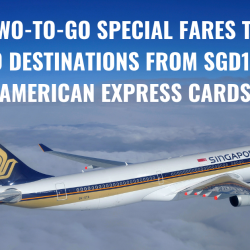 Enjoy exciting two-to-go and early bird fares to destinations worldwide from S$138 on Singapore Airlines with OCBC Cards! Be the first 350 customers to register and receive S$30 ChangiWiFi e-Cash vouchers when you register and spend at least $1,000 on singaporeair.com or SingaporeAir mobile app by 15 Dec 2017. It’s never too early to plan your next getaway. 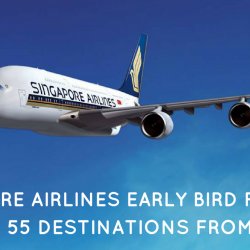 Especially with Singapore Airlines' early bird all-in fares to over 50 popular destinations starting from $148! Best of all, your holiday begins the moment you step on board, with countless entertainment options on Krisworld and their award-winning inflight service. Book your tickets by 31 March 2018. Create unforgettable memories in Europe with spectacular views and beautiful architecture. Enjoy attractive all-in fares from SGD1128 on Singapore Airlines when you book now till 19 November 2017. Terms and conditions apply.